These questions are what my aging parents ask me when I am talking to them. My mother, a three-time cancer survivor, lost most of her hearing from the side-effects of the chemotherapy, and my father lost his from aging. I have to be mindful when I talk with them so that they are able to hear me. That said, what if you are trying to converse with someone who has great hearing but who is not fully listening to you? Don’t take it personally. It’s not you. Nowadays, there are many obstacles that get in the way of effective communication. Here are three noteworthy barriers to consider and five solutions to help you become more successful at verbal communication. The more you understand the about barriers, the more you will be able to use the right skill to enhance your relationships and increase your success. According to a Nielsen report(2016), the average American spends almost half the day on a screen. To be exact, an average US adult devotes about 10 hours and 39 minutes a day consuming media. This number is expected to increase. Whether it be a phone screen, computer screen, or television screen, it is still something that people compete with to get the undivided attention of others. Another barrier is our decreasing attention span. More and more people are taking medications to help with their ability to “focus.” Why? Because we are living in the age of distraction. Distraction from technology that we have for personal use and professional use. In 2015, Time magazine wrote an article about Microsoft’s report on attention span. It was an article that caught the attention of the world showing that a goldfish has a longer attention span than the average human. It stated that the attention span of an average human has decreased to eight seconds mainly due to the widespread use of smartphones. While it might sound comical at first to have a simple house pet win over its master, the truth is not funny! 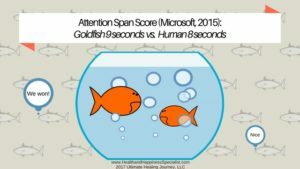 In the 2015 Microsoft report, a goldfish was able to sustain its attention for 9 seconds. One second more than its highly-evolved competitor. Moreover, this report shared that our attention span has deteriorated from 12 seconds in 2000 to 8 seconds today. 2000 was around the time of the mobile technology revolution. Another cause for the impaired communication is our need to stay in the know of what is going on all the time. This is what Linda Stone in 1998 coined continuous partial attention (CPA). Unlike the heralded act of multi-tasking where we are trying to do more than one activity at the same time to be more efficient, CPA relies on the need to not want to miss anything. This need to not miss out on any new connection or news makes us feel as though we must be constantly connected to media. According to Stone, CPA makes us feel alive when we are connected and plugged in. CPA is another barrier that inhibits our ability to fully listen and engage with another person. I hope I haven’t lost you yet. Are you still reading this article? If you are, thank you! Because I have 5 solutions to help you overcome these barriers so that you can have more effective communication and connection with people in your life. Some might think that what I am about to share are all common-sense-solutions. They are right! But as I mentioned in my book, The Happiness Result. More time, More health, More love, More success, common sense is not so common these days. 1. Mobile device: Put your mobile device away when you are about to talk with someone. PERIOD. 2. Eye contact: When you are talking with someone, make sustained eye contact with the individuals for about 3-5 seconds. Eye contact, according to James Wirth, social psychologist, provide us with some of the strongest information from social interactions. Be mindful and make eye contact. 3. Listen: Be silent when the other person is talking with you. Avoid interruptions like giving your opinions right away. Use this silent time to actively and empathically listen to what your mind and heart are telling you. Listen to the words being said and watch his/her body language (active listening) and try to pick up on his/her emotions (empathetic listening). Shut up and listen up. 4. Summarize: Once the individual is done speaking, rephrase or summarize what you heard. This will ensure that you fully understood the content of the conversation and show the individual that you were engaged with the conversation. Show you care and summarize. 5. Concise: Remember you have only 8 seconds to captivate someone’s attention. Therefore, speak clearly and concisely. The clearer you are expressing yourself, the less likely a misunderstanding and misinterpretation will happen. This is one of the basic elements of being a competent communicator. Get to the point. 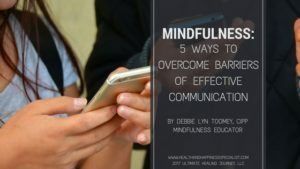 Next time you feel that you are not being heard or people are not listening to you, be mindful of the common obstacles that stand in the way of communication in this age of distraction. Try the 5 mindfulness solutions that I shared with you and above all else, keep practicing. Effective communication and mindful listening are skills. They require practice in order for you to master them. To learn more ways to add more time, more health, more love, and more success in your life, get a copy of my book, The Happiness Result. It will give you 7 awesome skills to live your best life. Click here to get the book www.TheHappinessResult.com. This entry was posted in Communication, Family, focus, happiness, Health, Intention, Kindness and tagged distraction, mindfulness, multi-tasking, relationships, success. Bookmark the permalink.